Dingy, stained teeth dampen anyone’s holiday spirits. Give yourself a bright smile with teeth whitening from Elmbrook Family Dental in Brookfield, WI. Time and lifestyle change tooth color. If you are dissatisfied with your healthy, but dull, smile, learn about teeth whitening at Brookfield’s premier dental practice: Elmbrook Family Dental. Drs. Brandon A. Brunner, Eric Taibi and Suzanne Tack offer a full menu of outstanding cosmetic dental services designed to deliver straight, bright smiles for people of all ages. From composite resin bonding to repair of minor cracks and chips to porcelain veneers that refinish teeth marred by deep discolorations, odd shape or other defects, Elmwood Family Dental can completely makeover your smile. 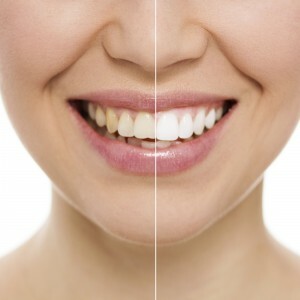 Professional teeth whitening is the safest and most predictable cosmetic dental service available today. Unlike over the counter toothpastes, strips and gels, teeth whitening from your Brookfield dentist causes little to no tooth and gum sensitivity and works quickly and reliably. Plus, the process is budget-friendly. Quality whitening utilizes professional grade hydrogen peroxide gel. Applied in the office or at-home, the gel lifts out the staining organic material trapped in the mineral matrix of tooth enamel and its deeper layer, dentin. Aging, prescription drugs such as tetracycline and deeply colored foods and beverages contribute to stained teeth. Smoking and chewing tobacco produces characteristically yellow and brown discoloration that are exceptionally stubborn. The dentists at Elmbrook Family dental offer 2 well-respected teeth whitening systems. The doctor evaluates the patient’s mouth to ensure teeth and gums are healthy. Depending on need and preference, Elmbrook Family Dental uses Kor Deep Bleaching or Zoom! whitening. Kor deep bleaching is fast, affordable and effective–so good, in fact, that it whitens the deep stains caused by treatment with the antibiotic, tetracycline. Applied in-office or at-home, tooth color brightens by several shades in just 25 to 35 minutes. The unique Kor tray system actually seals out saliva, allowing the gel to work more rapidly and effectively. Zoom! teeth whitening also brightens tooth enamel. In the office, supervised gel application produces a smile that is up to 8 shades whiter in color in less than an hour. Custom at-home trays deliver the gel accurately when worn for the prescribed time each day. At-home Zoom! can brighten your tooth enamel in plenty of time for the holidays, and afterwards, special touch-up pens keep enamel bright indefinitely. Why not explore professional teeth whitening for yourself by contacting Elmbrook Family Dental in Brookfield? Whatever system you and your dentist decide upon will give you that dazzling holiday smile and self-confidence. Contact the office today for a personal smile analysis.